I went to my first Japanese tea ceremony today. 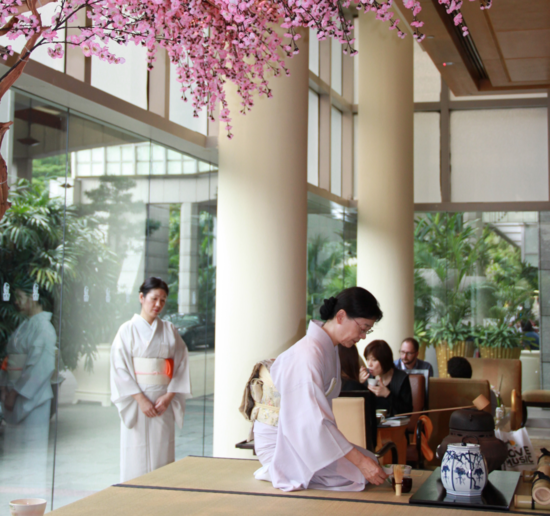 Actually, it was my first tea ceremony, period. Big whoop, you might think, except that six months ago I would have balked at such an opportunity. Before moving to Singapore last year, I was an avowed anti-tea-ite. I went to my first Japanese tea ceremony today. Actually, it was my first tea ceremony, period. Big whoop, you might think, except that six months ago I would have balked at such an opportunity. Before moving to Singapore last year, I was an avowed anti-tea-ite. I drank it perhaps a couple of times a year, usually against my will. But since coming here, I've grown to like tea, to appreciate its subtle, or brutal, flavor, and to enjoy the rhythm of a cuppa, the winding down to allow the tea to brew and then cool, the little nips at the cup to imbibe the liquid in small doses, the placement of the cup resting on the saucer, a small spoon tucked to the side. So when the chance to attend the ceremony, which sounded very grandiose and fraught with historical import, arose, I quickly rearranged my empty diary to make sure I was free. 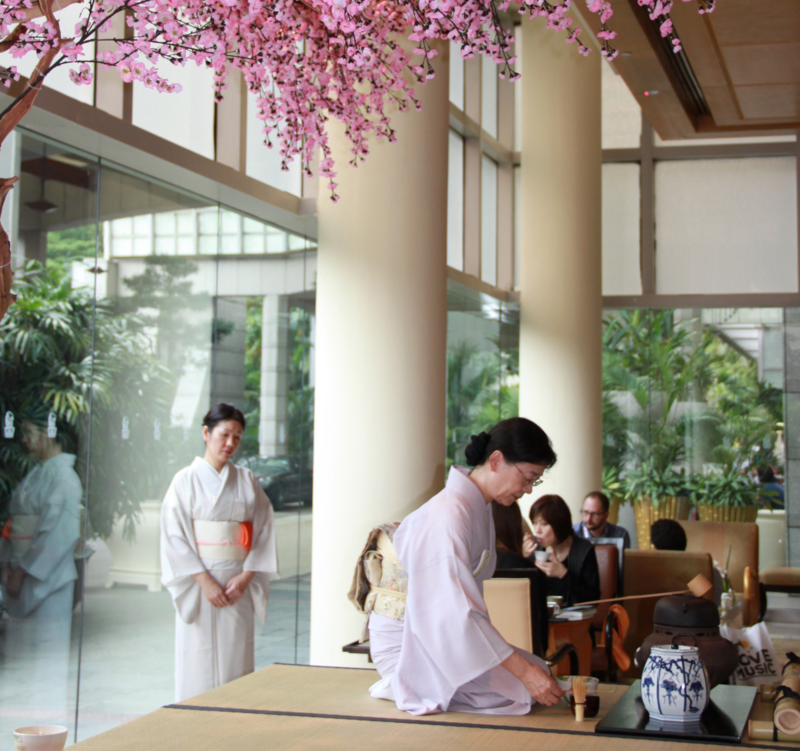 This ceremony was at the Ritz-Carlton Millenia, as part of a Japanese food series. It took place in the Chihuly Lounge, a bright, high-ceilinged space that, as the name suggests, has a wall filled with pieces of twirling blown glass made by the world's most eminent glass artist, Tacoma's own Dale Chihuly. I sat down surrounded mostly by Japanese families, and was soon sipping a nicely chilled passion fruit mocktail, and nibbling on rice crackers. Next up was a little bowl of seaweed noodles (clear, gummy, cellophane) in a broth of vinegar, soy sauce, and wasabi that were slippery on the tongue, and invigorating to the taste buds. While waiting for the tea tray to arrive, the chef who had prepared the food, a stern looking Japanese man with closely cropped hair and an unmistakably mischievous glint in his eye, did the rounds. He introduced himself, saying that he'd come from Osaka and how happy he was to be here. For no particular reason, I asked him why. He'd been here many times, he explained, and liked that there were many different races in Singapore, and many different types of food. Seemed like a sound explanation, but I did wonder whether that glint was the real story. Of course it was, but before I could find out more he shimmied off to another table. The tea and the food arrived, the former in a pot giant enough to appease an NFL linebacker who needed to flush something out of his system, the latter a circular engineering marvel dissected by three rows of multicolored nibbles. As I tucked into the green-tea roll (swirls of green-tea flavored rice cake interspersed with some kind of cream), pink mochi balls (I'm not usually taken with pink food, but this was pretty good), and seaweed-paste sandwiches (tasted like the British spread Marmite, which I can eat by the spoonful), two kimono-clad women appeared. They ambled to the tatami-mat-topped platform at the head of the room. One climbed up the three steps, knelt on her shins in front of two large vessels, and slowly, lovingly, measuredly wiped down her reedy, wooden stirring, mixing, and ladling utensils with a small red cloth. She then artfully transferred powdered green tea from an antique-looking glazed pot into a bowl, added boiling water from a grand metal kettle, and stirred. I watched. The rest of the attendees snatched occasional glances at the ceremony but mostly continued as before, as if nothing special were going on. A shaggy haired Brit attending a media conference in the ballroom stepped up to take a photo with his iPhone as the kimonoed women quietly went about their business. The ceremony seemed like an enactment frozen in time and space, as though it was happening on a screen that only I could see, or maybe it was in my mind. There was so little commotion. No introductory gongs blasting, or arching overtures about the cultural significance of this duo, or platitudes about the history of the tea ceremony in Japan. Just a simple ritual probably played out as it would in Japan. It was kinetically poetic, tenderly archaic, unashamedly unhurried, and refreshingly free of artifice. Then just as silently as they arrived, they slipped off. There was no applause, no cheering, no announcement by an MC drawing the afternoon's proceedings to a close. I did manage to get a portrait photo of them under a cherry blossom tree (below), though that took a bit of effort since they didn't speak a word of English, and I can only say about four things in Japanese (including big fish, which probably wouldn't have helped). I forgot to mention that they divvied up the matcha tea among the guests. It was strong--like a giant shot of warm wheatgrass juice--and savory. If that's what you get at the end of every Japanese tea ceremony, count me in next time around.